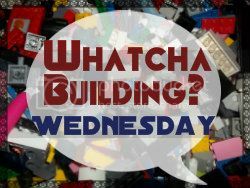 Welcome to Whatcha Building Wednesday, where we showcase our kids' current toy building brick projects. I know there are thousands of bloggers out there who have kids who build with LEGO and other toy building bricks. You can leave a comment below with a link to any of your kids' pictures of the projects, videos, diagrams or instructions your kids have made. . . . anything that will get the kids excited about their LEGO projects. Here is this week's creation from The Builder. You may comment with the link to your child's creations below!